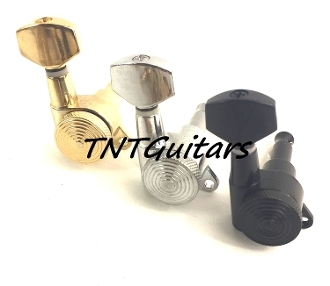 This is an enclosed-gear, threaded hex bushing, modern sealed style guitar tuning key. This tuner is a locking Sperzel Style guitar tuner and uses a set screw for enhanced stability. A thumbwheel on the back of the tuner controls the built-in metal locking pin. The pin is a removable part of the key. Simply pull your string through the eyelet, lock the thumbscrew down, and tune to pitch.